Thirty-seven students were inducted into the Franklin High School chapter of the National Honor Society on Mon., Dec. 3. 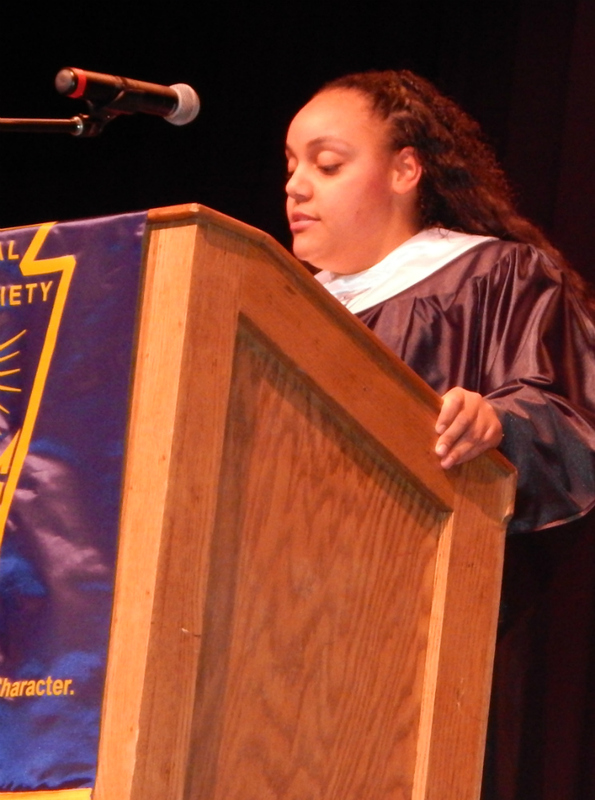 National Honor Society membership is one of the highest honors that high school students can achieve. Six seniors and 31 juniors were tapped for the honor. NHS recognizes students for outstanding character, scholarship, leadership, and service. Students must have a minimum grade point average and are nominated by teachers. Seniors inducted were Kayla Gillespie, Brayden Hall, Sierra Makley, Maggie Moore, Emily Newton, and Dylan Powell. Juniors inducted were Elyce Aldridge, Mary E. Baker, Allisyn Brinkman, Hannah Cundiff, Tyler Dishun, Kristin Earles, Madison Earles, Samantha Earnhart, Will Emrick, Olivia Faulkner, Pierce Finton, Devant Geter, Haili Groves, Kaylee Harris, Zach Johnson, Jared Kremer, Drew Lawson, Kelsea Madden, Shannia Mangroo, Chloe Miller, Kyra Napier, Sidnie Penny, Alison Perez, Madi Powell, Karsen Quillen, Adriannia Richards, Karlie Rickard, Noah Stephens, Brooke Stover, Ashley Townsend, and Braden Woods. The 2018-19 officers are Alexis McGregor, president; Cooper Daniels, vice president; Kelly Fultz, secretary, and Davis Mears, treasurer. The group includes 31 additional members who were inducted in 2017. They are Lillian Baker, Cyara Barge, Emma Bicknell, Erica Black, Aaron Blake, Jacob Bowermaster, Katherine Coffey, Cooper Daniels, Grace Delcamp, Sabrina Ellison, Kylee Fox, Kelly Fultz, Alexander Gentry, Jeremiah Harbison, John Harris, Braden Hitte, Alexis McGregor, Cassidy McNinch, Davis Mears, Marissa Milham, Brianna Milligan, Riley O’Connor, Jaiden Perez, Taylor Senters, James Smith, Dustin Stewart, Blake Swoll, Mikayla Torrance, William Warden, Skyler Weir, and Kyle Wertz. During the ceremony, the NHS chapter also honored two teachers of the year: Dawn Harris, Franklin Junior High School, and Steven Burnett, Franklin High School. The group's advisors are Alisa Humphrey and Melissa Edwards.